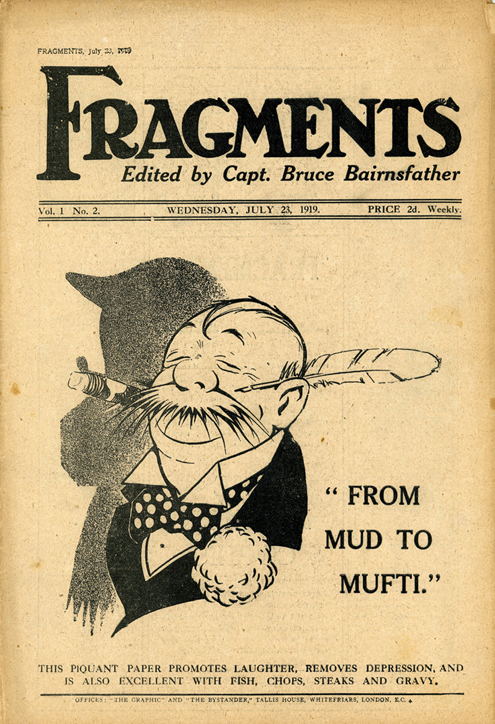 As part of his new contract with the publishers of The Bystander in the summer of 1919, Bruce Bairnsfather was made Editor of his own weekly Fragments magazine. The first issue was published on 16 July 1919, amid much publicity. 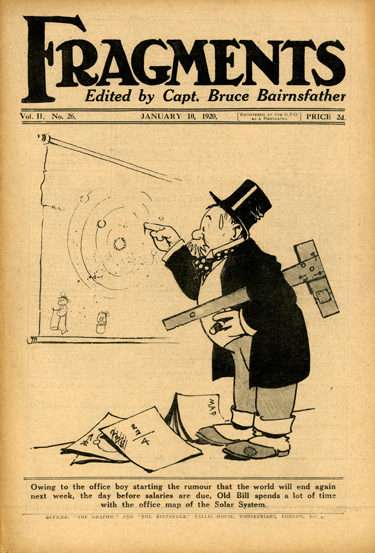 Bairnsfather drew the cover cartoon, wrote the opening editorial - 'Old Bill's Letter' and contributed other articles and cartoons to each issue. There were numerous other contributors from the Bystander stable of artists and writers. 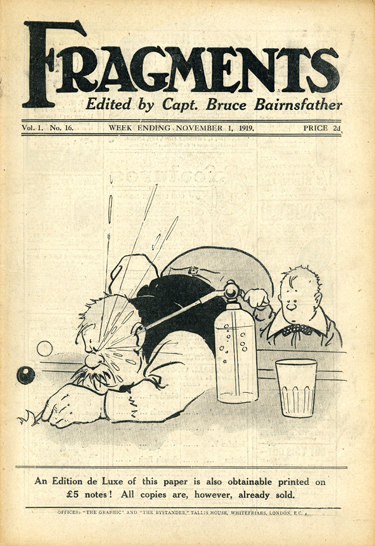 The magazine was given plenty of publicity ahead of the first issue, and the publishers of The Bystander made a big play on the fact that Old Bill was to have his own paper. They went so far as to claim that the two great events of 1919 were the signing of the Peace Treaty at Versailles on 28 June, and the first issue of Fragments on 16 July. 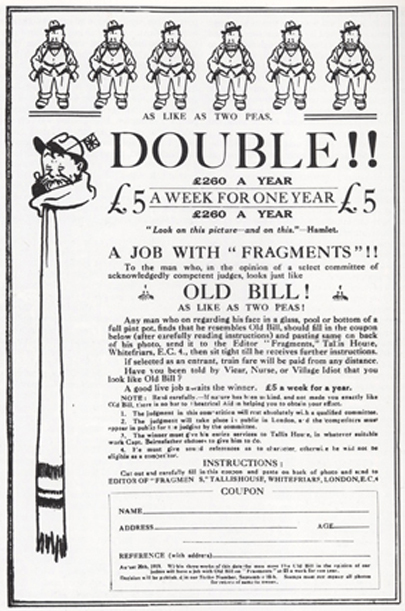 The demand for Fragments far exceeded everyone's expectations, and the publishers found themselves 300,000 copies short on orders for the first issue alone. By the second issue orders received for number one totaled over 1 million copies, and sales continued to rise every week. 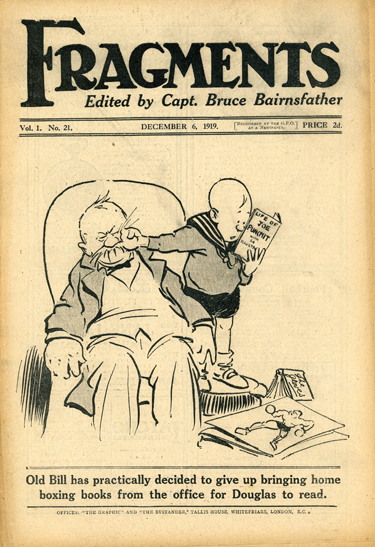 Bruce Bairnsfather was delighted with his new venture, and his output for the magazine was considerable. 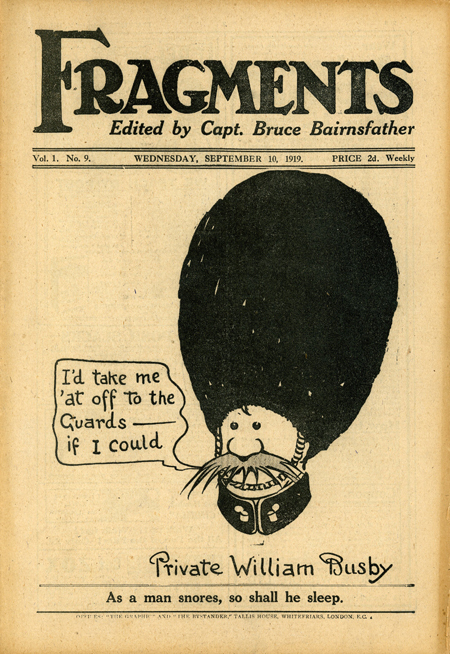 He drew the cover for each issue, as well as contributing at least one full page cartoon, and various editorial content including 'Old Bill's Letter' and articles on all manner of subjects. There was also an 'In Reply To Yours' page where he responded to readers letters, and the magazine also ran numerous competitions. 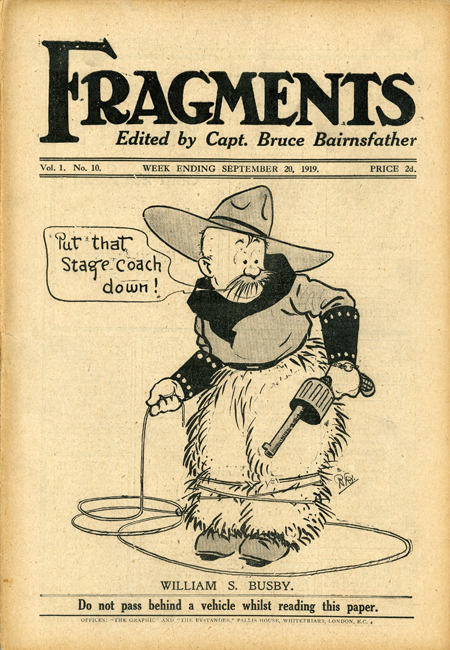 Fragments had a number of other regular contributors, including Victor Hicks, who provided illustrations for a theatre page, and Edward Wighill, a political cartoonist. The work of more famous artists like Barribal and W Heath Robinson (who contributed a series under the title 'Leaves from a Boy Scouts Diary') also appeared in its pages. 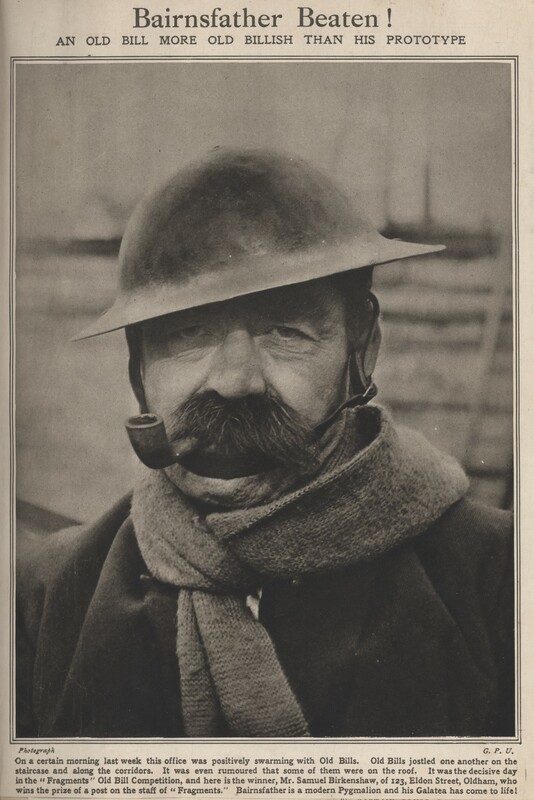 One of the most popular ompetitions run by the magazine was the search to find 'Old Bill's Double.' Launched in August 1919 this attracted an enormous response, and the winner was announced in the 11 October 1919 issue as Samuel Birkenshaw (right), an ex-policeman and former soldier from Oldham, who won the grand sum of five pounds a week for a year. After the initial announcement, no further mention was made of Samuel Birkenshaw, or the duties he undertook as Old Bill, in exchange for his prize money. 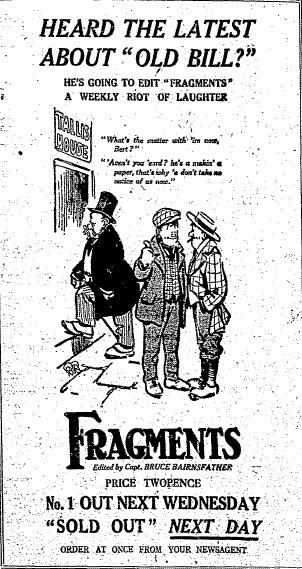 By October 1919, Fragments had sold in excess of 7 million copies. 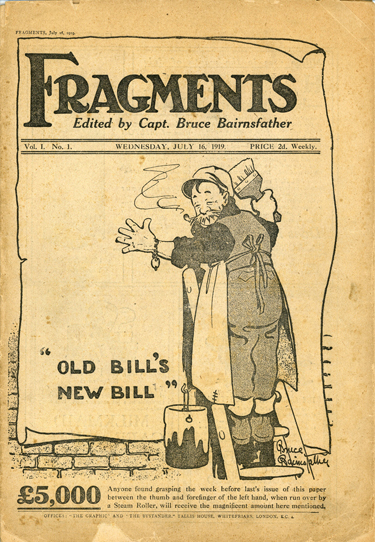 Its popularity continued, and a special 'Christmas Fragments' edition was produced in 1919, with a colour cover by Bairnsfather. After 15 months, and without any prior announcement or hint, Fragments ceased publication suddenly, with the issue dated 16 October 1920.